Leaching losses of nitrate from forests can have potentially serious consequences for soils and receiving waters. In this study, based on extensive sampling of forested watersheds in the Catskill Mountains of New York State, we examine the relationships among stream chemistry, the properties of the forest floor, and the tree species composition of watersheds. 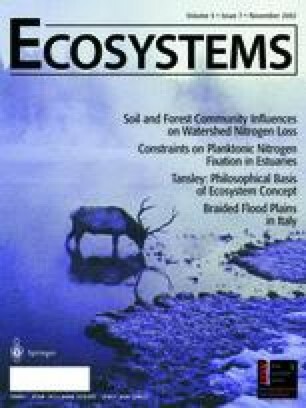 We report the first evidence from North America that nitrate export from forested watersheds is strongly influenced by the carbon:nitrogen (C:N) ratio of the watershed soils. We also show that variation in soil C:N ratio is associated with variation in tree species composition. This implies that N retention and release in forested watersheds is regulated at least in part by tree species composition and that changes in species composition caused by introduced pests, climate change, or forest management could affect the capacity of a forest ecosystem to retain atmospherically deposited N.
Key words: carbon; nitrogen; watershed; nitrate leaching; tree species; soils; Acer saccharum; Quercus rubra. Received 4 March 2002; Accepted 4 June 2002.